Online ATS excel 2016 password recovery software to recover excel password . The current version of MS Office is 2016 which has stand a popular record in computer market. Excel is the best and prominent database application of the ms office bundle .As we all know about the excel database management and also about its security and encryption .Many of the moment we forget and skip password from the mind and become unable to open excel database sheet .Here I am specially talking about excel 2016 otherwise this software is universal .Your mind can also ask question to yourself that how to recover excel 2016 file password .So choose (Atom TechSoft ) ATS excel 2016 password recovery software to remove password from excel 2016 . Lets know about the role of this ATS password recovery tool to open excel 2016 . 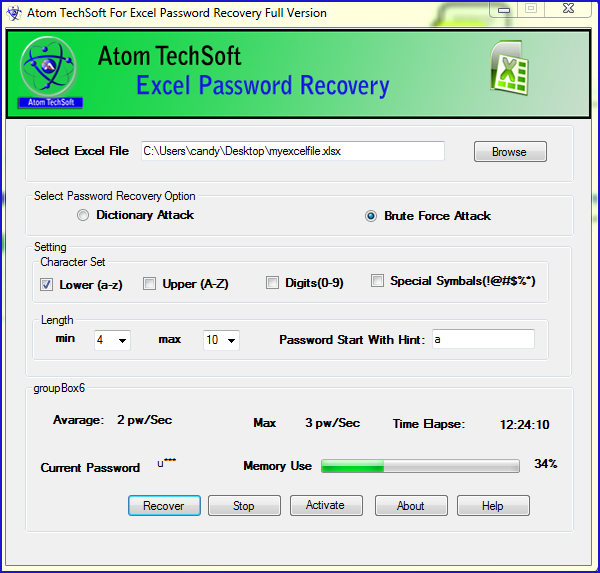 Simply this ATS password recovery application open and break excel temporary encryption with great idea and remove password from excel 2016 sheet .How this whole process proceed through the software .Step 1* You have to add excel 2016 sheet in the software .Step 2* Check on the option brute force / Dictionary attack as provided .Step 3* Click on the recover button to go on .Step 4* Software is processing and you have to wait .Step 5* Be happy because your password has been pop up on front of you . one of the best solution to recover lost Excel file password and unlock excel file.